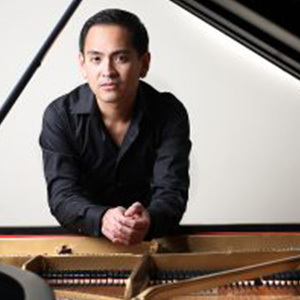 Hailed by The Washington Post for his “poised and imaginative playing,” pianist  Victor Santiago Asuncion is recognized as an artist of innate musical sensitivity, fiery temperament and superb technique. As a recitalist and concerto soloist, he has appeared in concert halls in Brazil, Canada, Ecuador, France, Italy, Germany, Japan, Mexico, the Philippines, Spain, Turkey and the USA. He played his orchestral debut at the age of 18 with the Manila Chamber Orchestra, and his New York recital debut in Carnegie’s Weill Recital Hall in 1999. In addition, he has worked with conductors including Sergio Esmilla, Enrique Batiz, Ze’ev Dorman, Arthur Weisberg, Corrick Brown, David Loebel, Leon Fleisher, Michael Stern, Bobby McFerrin, and Mei-Ann Chen. A chamber music enthusiast, he has performed with artists such as Lynn Harrell, Zuill Bailey, Andres Diaz, Antonio Meneses, Joshua Roman, Cho-Liang Lin, Giora Schmidt, Susanna Gilmore, James Buswell, James Dunham, Ronald Leonard, Susanne Mentzer, H.K. Gruber, John O’Connor, Marc Neikrug, Liang Wang, Catalin Rotaru, and the Dover, Emerson, São Paulo, Serafin, and Vega String Quartets. He was on the chamber music faculty of the Aspen Music Festival and School, and the Garth Newel Summer Music Festival. He was also the pianist for the Garth Newel Piano Quartet for three seasons. His recordings include the complete Sonatas of L. van Beethoven with cellist Tobias Werner,  Sonatas by Shostakovich and Rachmaninoff with cellist Joseph Johnson, and the Rachmaninoff Sonata and works arranged by Piatigorsky with the cellist Evan Drachman. He is also featured in the award winning recording Songs My Father Taught Me with Lynn Harrell, produced by Louise Frank and WFMT-Chicago. In addition to his active performing career, Mr. Asuncion is sought after as a piano, vocal, and chamber music coach. He received his Doctor of Musical Arts Degree in 2007 from the University of Maryland at College Park under the tutelage of Rita Sloan.